Vitamin D3 5000IU 100 caps. Since vitamin D3 is fat-soluble, it should be taken with fat meals. This will ensure its maximum absorption. 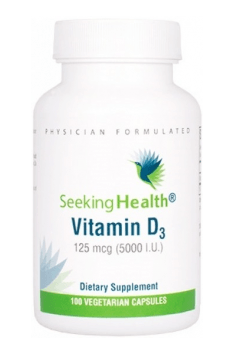 Vitamin D3 cooperates with vitamin K and that is why it is recommended to take 25 mg of this vitamin in line with each 1000 IU of vitamin D3. In addition, calcium should be taken when supplementing vitamin D3 to facilitate its normal absorption and utilisation. It is not advisable to exceed the dosage recommended by the manufacturer. In the case of increased physical activity and diseases, you can take 10 000 IU daily, but only for a couple of days. Do not take higher doses than 20 000 IU because of a potential toxic effect of cholecalciferol in such amount. It is recommended to test blood levels of vitamin D3 metabolites regularly to select the proper dosage.